BORREGO SPRINGS, Calif: It started with the desert lilies in December. 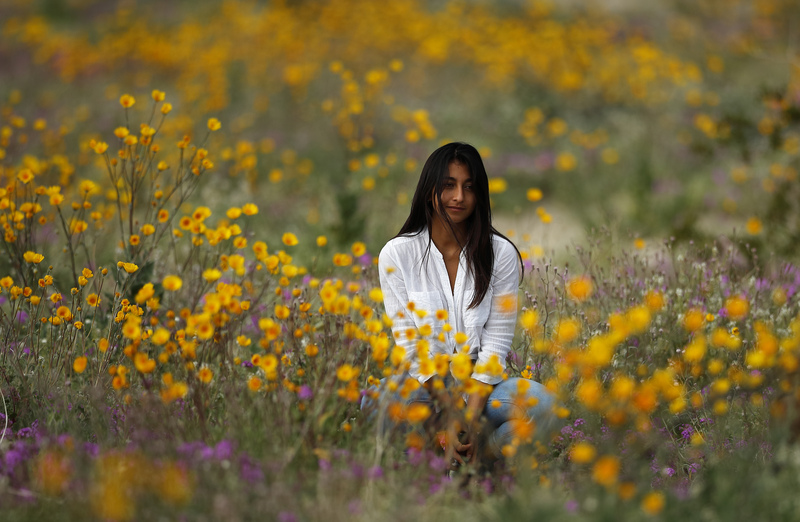 Since then a wave of wildflower blooms has been crescendoing across Southern California's Anza-Borrego desert in a burst of color so vivid it can be seen from mountain tops thousands of feet above. 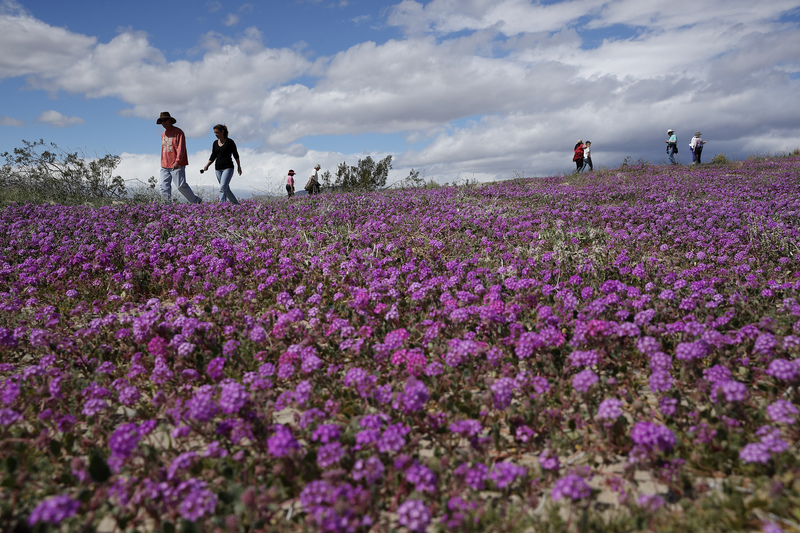 Two years after steady rains followed by warm temperatures caused seeds dormant for decades under the desert floor to burst open and produce a spectacular display dubbed the "super bloom," another winter soaking this year is expected to create possibly an even better show by Mother Nature. 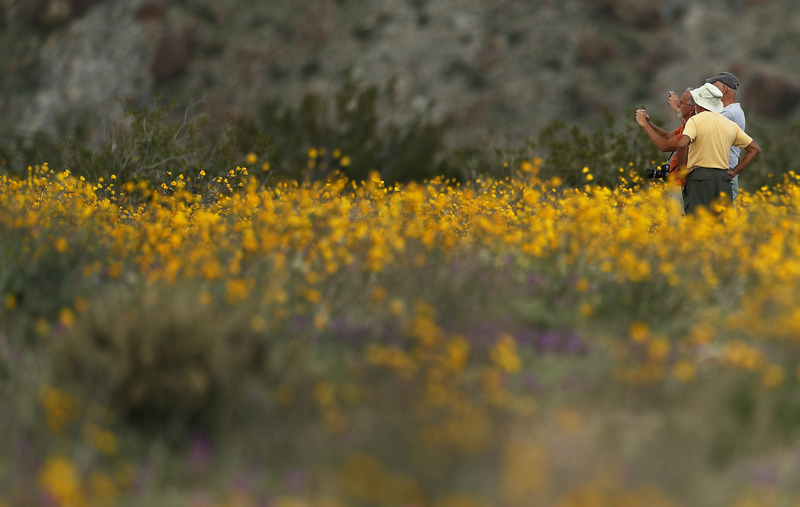 "There's just an abundance in where it's blooming and it's coming in waves," said Betsy Knaak, executive director of the Anza-Borrego Desert Natural History Association, which tracks the blooms. "It's unreal," Rawding said. "It's just like they said — so beautiful."  There are tapestries of hot pink Bigelow's Monkey Flower, purple Sand Verbena, delicate white and yellow Evening Primrose and of course the desert lilies, which bloomed extremely early, opening up in December, signaling a super bloom was possible. "It's a painting of colors at the moment out there in many of the areas," said Jim Dice, reserve manager of Steele/Burnand Anza-Borrego Desert Research Center, University of California Natural Reserve System. So far, six times the amount of rain has fallen in the Anza-Borrego desert this weather season compared to last year, Dice said. If the caterpillars and freezing temperatures stay away, the already gorgeous wave of wildflowers could intensify and light up other areas well into spring. The state park with 640,000 acres (1,000 square miles) is California's largest, with hundreds of species of plants including blazing stars and the tall spiny Ocotillo, which are covered in buds that will open to flaming orange-red flowers. A research associate at Dice's center recently hiked up to the top of Coyote Mountain and shot a photo of the purple fields 3,000 feet (914 meters) below. "It was pretty spectacular to see that from up above," Dice said.